Even if you have the best roof in the world, it can still underperform if it isn’t installed properly. This is why it’s important to hire a trusted, reputable, and highly experienced roofing company to provide you with quality installation services. By choosing a reliable installer, you can get peace of mind knowing that your roof will last and serve you for a very long time. 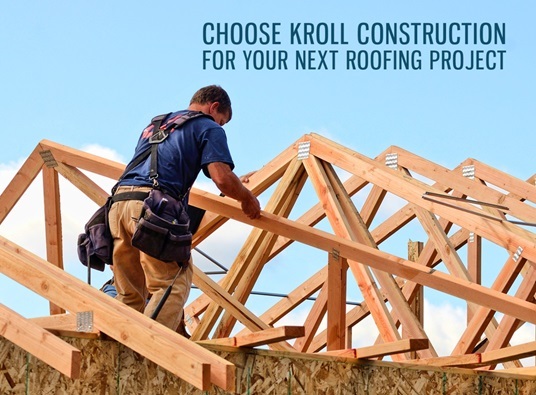 Kroll Construction is one of the top roofing companies in Michigan. For decades, we have been providing local homeowners with top-notch home improvement services to help them create safe and comfortable living environments for their loved ones. If you’re considering replacing your roof, here’s why you should enlist our services. From our estimators to our installers, we hire only the best in the industry to be part of our team. And once they get on board, we make sure to provide them with continuous training so they can improve their skills and get even better. Thanks to our well-trained and highly skilled contractors, our customers can always expect top-quality services from us. Founded in 1961, Kroll Construction has more than 50 years of roofing experience. Because we have been repairing and replacing roofing in Michigan for so long, we know exactly what to do to give our clients tailored roofing solutions that meet their specific requirements. We are fully trained and certified by the manufacturers of the building materials we use in our home improvement projects. These manufacturers include Owens Corning, Alside, GutterCap, and IKO. The certifications we have received give our customers the guarantee that we are one of the leading roofing contractors in Michigan that use the latest installation methods and techniques to ensure a job well done. For quality roofing services, be sure to hire only the best in Michigan. Please call us at (888) 338-6340 to get free in-home consultation.